More and more people are investing in real estate. While many of them choose a long term investment of purchasing property and renting it out to tenants, others choose short term investments and flip houses. To flip a house means to buy it, usually renovate it, and sell it for a profit. If all goes well with the renovation and the sale, the person flipping the house can stand to make thousands, if not millions of dollars. Hugs Construction has worked with many investors who are interested in flipping houses, and can share tips for how to flip a house in Los Angeles succesfully. 1. A Home Inspection – The low price of a house may attract certain buyers that are eager to flip a house, however, there is usually a good reason why a house is priced lower than it’s worth. A lot of the time, there can be an underlying problem affecting the house. Even if you walk through the house and nothing stands out to you as unusual, it is extremely important to conduct a home inspection prior to your purchase. “The standard home inspector’s report will cover the condition of the home’s heating system; central air conditioning system (temperature permitting); interior plumbing and electrical systems; the roof, attic and visible insulation; walls, ceilings, floors, windows and doors; the foundation, basement and structural components,” according to the American Society of Home Inspectors (ASHI). HouseDetective.com adds that: “the focus of a home inspection is not merely the quality of construction, but the overall level of maintenance versus deterioration of the property, the operability and shortcomings of fixtures, compliance with numerous safety standards, the projected longevity of various materials and components, old versus new standards of construction, and much more.” Therefore, to make a wise choice as to what house to purchase and flip, make sure to do a proper home inspection. 2. The Right Los Angeles Contractor – A Los Angeles renovation contractor will be your most important partner when you’re deciding to flip a house in LA. To get the biggest return on your investment, you want a good renovation at a reasonable price. Unfortunately, many contractors can underestimate a job, or offer a low price only to charge more later. Therefore, get recommendations for a quality LA contractor prior to making a commitment on a house. Your contractor should come out and do a walkthrough with you in the house you’re looking to buy, and provide you with an estimate based on the home inspection and the walkthrough of how much it would cost to remodel it. There are certain rooms that provide a bigger return on your investment, such as the kitchen and bathrooms. You should always add about 10% to the estimate to account for any unexpected repairs. A good renovation is the number one key to getting the most upon flipping your house. 3. Curb Appeal – You can’t show prospective buyers the great updates you put inside the house, if they are turned off by the outside of the house. Remember that curb appeal is the first impression someone will see. Make sure the house has a fresh coat of paint; popular paint choices are beige, gray and other earth tones. Make sure the landscaping is green and pleasant looking. 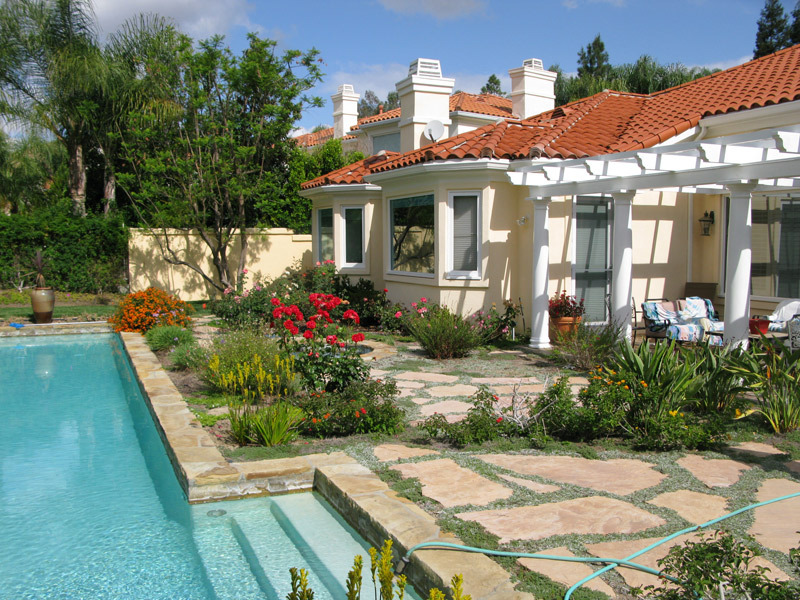 In the hot California climate, a house that has been on the market for a while, especially a foreclosure, will typically have wilted grass and plants due to the lack of care. Invest your time and gardening skills into replanting the front and backyard. Check out my blog about San Fernando Valley green landscape tips for ideas. Hugs Construction has over 20 years of experience and is a full service construction company in the San Fernando Valley and surrounding Los Angeles area. We specialize in helping investors flip houses with the help of our construction team. We work on projects of all sizes, such as kitchen and bath remodeling, wiring and electric work, soundproofing, installing windows and doors, specialty projects and new constructions. To get a quote for your construction project when flipping a house, contact us.